Marianne Freiberger reports on a discussion she had with Bernard Carr on whether or not multiverse theories are science. He has a suggestion for how we should classify these theories. “Meta-cosmology” seems like an obvious dance around the term “metaphysics”, a term physicists seem to hate having applied to any theories they discuss. But it seems like that label makes sense for speculations about unseen and untestable realms. Of course, accepting it means accepting that physicists engage in philosophy, as least to some extent. We should remember that many of today’s scientific concepts, such as atomism, began as metaphysical speculation. Personally, if it makes cosmologists happier, I don’t see a problem with referring to multiverse theories as speculative science, provided that the “speculative” isn’t dropped. Along the lines of Carr’s reference to calls some have made to change the criteria for established science, I think doing that would, at a minimum, do damage to cosmology’s credibility. This entry was posted in Zeitgeist and tagged Bernard Carr, Big Bang, Cosmology, metaphysical speculation, Multiverse, multiverse theories, Philosophy, Physics, Science, speculative science, the multiverse, theories. Bookmark the permalink. 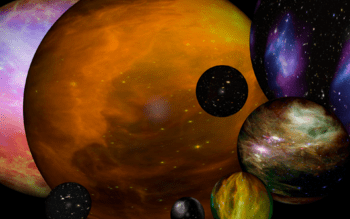 8 Responses to Multiverse theories: “meta-cosmology”? Scientists ‘speculate’ all the time and offer as much under an assumed banner of Fact, mostly because among their kind they happen to agree upon the ‘likelihood’ or ‘suitability’ of such descriptions put forth as legitimate. The history of the Universe, of Matter, Time and the creation of Space (Big Bang, with its consequences), all having common, and mythological proportions of importance for the ‘scientific’ community and those who talk about the same in Public today: just about as Bogus as Bronze-Age religions, as for true Science. BeingQuest, just to make sure I’m understanding you correctly, are you saying that the Big Bang is just as mythological as Bronze Age religions? If so, I’m curious what leads you to that conclusion. What would your criteria be for true science? I AM saying that, as the Speculation rests upon as little evidence as any Monotheistic faith and the assertion of a Creation Event over seven days (whatever ‘days’ means in their mythology (I think, literal mostly)). Many things have led Speculation, in ‘science’, from the assumption of a Big Bang theory of the Origins of the Universe. Such speculation cannot be Science, but a more acceptable, modern form, of Philosophy, Natural albeit. This does not convincingly distinguish it from former Speculations, except for the assumption of confidence which Modern Conceits (with some good reason) have attached to Ontology. It’s a Reductionism of Reason without convincing justification, per Science. As to Definition, which you would have me clarify or justify for my Criticism here. Science is not just a Process…in fact, it’s NOT a Process at all, but a Product. Speculation does NOT lend to Science, but is at best a suggestive means of exploration and discovery on the Road to Science. Science is Knowing, NOT Speculation; though the former leads to the latter, not being equivalent. I do not believe that I am telling you anything here, but iterate a passion for Evidence that founds True Knowledge against the claims of even justifiable (paradigmatic) perspectives on available evidence (quasi-facts). With few exceptions, the ‘criteria’ constituting Science in various disciplines is vastly contested, Physics and Celestial Mechanics being more secure than all others, though not unassailable under certain conditions of the Quantum Field. But these are Practiced, and do not venture past Experience and the requisite applications of modern technology, and thus stand so secure thereby…they are near at hand. What Speculation of ‘science’ trespasses Experience ventures every presumption of Fact worthy of a Bronze-Age Monotheist (Scientific Cool-Aid), and can be clearly seen in the Story most tell of the Origins of the Universe and Cosmic Evolution. It really doesn’t matter that the Story ‘science’ tells of these is relatively innocuous (in fact, untrue…and potentially misleading), but made worse by the absence of Evidence and actually pure Speculative quality of such…virtually metaphysical. True Science is a fairly limited discipline, wholly divorced from Speculation. It is Objective, it is Practiced, it is Reproducible in any and all environments like constituted. It can be Certified by any like application of Investigative Procedure and explained by already known constructs of tangibly affirmed experience. Science, at bottom, is Experience well investigated. NOT Speculation. One might add that there are, and will be, exceptions to the last Standard expressed my last paragraph, which we call Paradigm Shifts in Science, where the prior Standards are in some way discarded for the better integration of Evidence, leading to qualified trajectories of Investigation that the former Paradigm could not account for. This DOES happen, and will happen frequently the more of past illusions wrought by Speculation alone are discarded for a more open-minded form of the same (practiced experiment, on a more vastly inclusive, logical plane of possibility). I appreciate your clarifications. I agree with a lot of what you said. Science often is far more limited than most people realize, although I see it more as varying degrees of certitude rather than sharp distinctions between knowledge and mythology. I agree that experimental science enjoys the highest certitude, followed by observational sciences, and then logical and mathematical reasoning. But even logical and mathematical speculation I see as far more rigorous than mythology or uninformed speculation. I’m still curious why you see the Big Bang as being akin to mythology. It seems to me to fall into observational science. I’m assuming you’re familiar with the 85 years of observations which astronomers think sustain it (expanding universe, cosmic microwave background, etc). What about those observations do you think fails to establish what they are assumed to establish? May it legitimately enter into our Speculation whether the observable ‘laws’ of the Universe are constants or something perhaps akin to the more-or-less settled (calmed) Chaos preceding the Order and Fabric of the observable continuum of Space/Time? No matter how you cut it, Mythologies are Narratives, whether having Subjective substance (metaphorical) or based upon the assumed Objective constitution of Things, so conceived. The latter being mostly a more convincing rationale for the substance of Narrative than the former, under Aegis of our present Scientific Method, but not quite achieving the status of assumed Necessity which Natural Law, or the laws of the Universe, acquire by the attributive rationale of the Empirical Technique of Investigation (albeit laudably consistent with known or Objectively construed Data points). I think that, to admit the pre-natal origins of the Cosmos (Chaos) is to admit that the above Fabric is, like a material sheet overlaying (condensation of a sort and Veil) the fundamental Chaos of the Universe, an evolutionary product wrought as much by Accident, if not more-so, than by what we take to be the settled constancy or universality (omnipresent) Order of Natural Law and science of Physics today. This pre-natal origin IS inaccessible through Objective or Empirical analysis alone, while Speculation lends an interesting perspective to the evolutionary status and make-up of this same observable Fabric we call Cosmos (the Object of Physics itself). Basically, what we are calling Physics IS grounded on Metaphysics, and so enters into Mythology as a Narrative on the Objective plane as anything like construed Subjectively and discarded today as Bronze Age Speculation, albeit gods supplanted by elements. I would only caution Care be taken to not assume more than human reason, mathematical logic or the Scientific Method under Aegis of Empirical Methods, has a right to claim in regards the certitude of its Speculation; as Speculation must remain fundamental to the advance of Science going forward (a no brainer assertion), and rightly so…and which must open-up upon predictably wonderful Paradigm Shifts for Science in the Age/s to come that will likely overturn important assumptions that today are taken for certitude as to the Objective status of this Fabric of the Cosmos. Truth be known, Science is but a more rationally convincing form of Mythology, the evidence for which is given across a whole range of valid cognitions among Fields of ‘science’ over the course of the last 200 yrs, at least…the distinction between Subjective and Objective qualities to this Matter being mostly a issue of scholastic dispute and NOT necessarily one of Science, of itself. We see the Cosmos through the Prism of Perspectives we have defined for ourselves, however convincing the ‘evidence’ deployed to justify the cognitive certitude of our rational claims. At any rate, all this is also but a claim and stands only to Reason as a Care for how we come to believe what we think to Know of the Cosmos, an epistemology that grants no Real status of Privilege for the Objectivity of our Observations over the Subjective grounds upon which ALL observation can be made, whatsoever, despite the often over-weaning conceits of certitude attending our ‘scientific’ discipline and methods of investigation. Science, as an Icon of Reason informing our belief systems today, has achieved a convincing potency, no doubt; but has as often confined itself, even halted its advance, by the very means it lauds as having achieved its present and convincing status as human cognition…an evolutionary product as possibly Accidental as the Cosmos itself and subject to be overturned as immediately as any Big Bang theory of Chaos at the outset. I would predict that such a Paradigm Shift is in the making such as will lend credibility to my claim here, but with the proper Care, will serve to open-up Fields of Investigation which are as yet, undreampt of (Mythological). And that’s a Good thing. …“metaphysics”, a term physicists seem to hate having applied to any theories they discuss. Some physicists are not meta-physicists, but the former would be an exception to the Rule you describe. Slippery slopes here, though conventional Physics, like Academia, keeps every tutor in line, yes? Today’s physicist may well be like the metaphysicist of 200yrs prior. The reverse will be said of today’s physicist, as equally mystical as those their own times condemned for ignorance. THIS is actually how the evolution of Science works…the wise of one generation but the natal fools of the next, in Science.